This 2003 chestnut gelding is by Matoi and out of the Saddlebred mare Royal Dekeration MJB. He was shown successfully on a regional level and at Scottsdale in-hand in 2004. 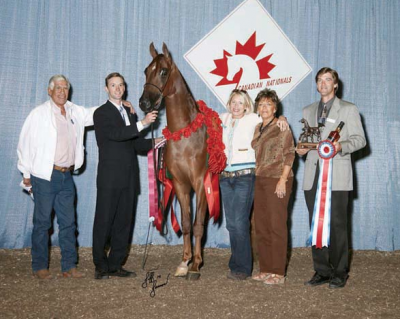 He went on to claim the 2006 Canadian National Champion title in the Half-Arabian Futurity Gelding In-Hand class and was Top Ten that same year at the U.S. Nationals. In 2007, he began his under saddle career as a Country English Pleasure junior horse, earning top honors at the regional level.